Picking a good, clean shot depends on your level of experience and proficiency. I asked Mike Roux an outdoor writer and Pro-staff member for Lohman Game Calls his thoughts on shot placement. By the way, Roux just happens to be the chief technologist of nuclear cardiology at Blessing Hospital in Quincy, Illinois. Roux always encourages hunters to aim for the lungs over a heart shot. He believes the benefits of a double lung shot are vastly improved when compared to a heart shot. "From a physiological standpoint", Roux explains when there is trauma to the heart the body automatically responds by shutting itself down. This causes the blood in the body to move slower. blood circulation decreases and less blood exits the body. 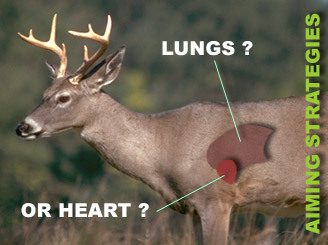 Therefore, a heart shot deer may not bleed as much compared to a lung shot. Conversely, Roux states: that, "on a double lung hit, the wound causes the heart to beat harder. This is mainly due to the loss of blood pressure. As the body tries to compensates for the loss of blood pressure to supply the brain with blood, the heart pumps harder. Whenever the heart beats faster, more blood is lost and a hunter has a better chance of finding the animal". By no means do I suggest that a heart shot is not effective. The fact is, a heart shot is lethal. This is simply a good rule of thumb to remember whenever you are picking your shot. The lungs also provide a larger target area that gives hunters an easier shot as compared to the smaller sized heart. With this information in mind I asked Roux his opinions on the "waiting game" after a confirmed hit? Like most of us, he suggested waiting 30 minutes. Whenever hunters push deer, the type of shot and the amount of adrenalin within the animal determines how far a deer will run. The further away a deer runs often times lessens your chances of finding the animal. What is the difference between a gun and a bow and arrow hit? Unlike a bullet hit, Roux explains, "When a deer is hit with a broadhead, many times he doesn't know he's hit, he just knows something is wrong. There is no adrenalin surge associated. The deer weakens from blood loss and lies down. If you give him enough time to "bleed out", that's where your blood trail will lead. If you track too soon and jump the deer, or he sees or smells you, this is where a rush of adrenaline keeps him moving. Increased adrenaline can cause a deer to escape from you and move quite some distance after the bleeding has stopped. This can make deer pushed too soon very hard to find".